Gianluigi Buffon’s last match in football was supposed to be the World Cup final in Russia with the legendary goalkeeper lifting the trophy before retiring. But that won’t be the case after Italy failed to even qualify for next summer’s tournament after losing 1-0 during a two-legged play-off with Sweden. It means we will have a World Cup without Italy and, ultimately, without Buffon. 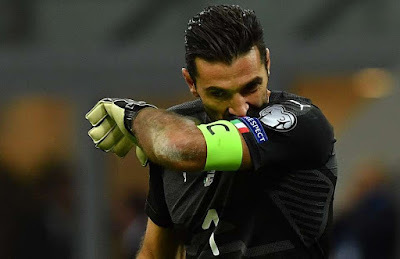 With the 39-year-old already suggesting that this current season will be his last, many football fans already knew that if Italy failed to get the better of Sweden, Buffon would be announcing his retirement. And that’s exactly what happened just moments after the referee blew the final whistle at the San Siro, confirming Italy would miss their first World Cup since 1958. During a pitch-side interview with Italian TV, Buffon couldn’t hold back the tears as he confirmed his retirement. "I'm not sorry for myself but all of Italian football,” an emotional Buffon said. “We failed at something which also means something on a social level. There's regret at finishing like that, not because time passes. Seeing Buffon in tears like this has devastated many football fans. But it’s not just football fans that were moved by Buffon’s tears, it seems. That’s because a fellow legendary goalkeeper took to Twitter to show the Italian some support on Monday night. That man was Iker Casillas. Beautiful. Just beautiful. From one goalkeeping legend to another. Incidentally, it was Casillas’ Spanish side that topped the World Cup qualifying group meaning Italy had to drop into the playoffs. However, they were fully expected to beat Sweden during the two-legs but failed to score over the course of 180 minutes. As a result, we will never see Buffon play for his country ever again after earning 175 caps for the Azzurri.